Watching the 1977 CBS TV Special Elvis In Concert is always an emotional roller coaster. I was made aware of this once again as I wieved a copy of it that my brother gave me as a gift a couple of days ago. 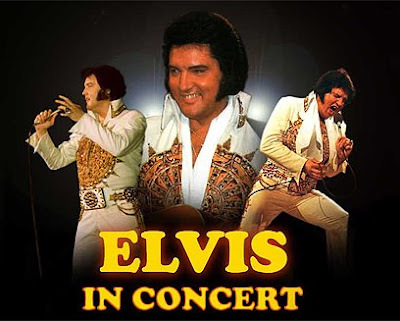 Most of the footage used is from the concert on June 21 in Rapid City, as the other show filmed two days earlier in Omaha was a very bad one, showing a pale, overweight and uncertain Elvis. The Rapid City show was better with Elvis looking a little bit healthier and singing better, too. Still, looking at what the TV cameras captured, I was torn between thinking how ill he looked during his last tour and what a strong voice he still had then. A good example of this is Elvis' performance of "My Way," used to great effect four years later in the movie This Is Elvis. "Poor Elvis," I thought as I watched it this time, at the same time thinking what a fantastic performance it was. My view of Elvis in Concert certainly isn't unique. Even Elvis Presley Enterprises seems to share it: "Because of the severity of Elvis' health problems at the time the special was shot, Elvis was far from his best in the way he looked and the way he performed, though there are some truly brilliant moments in the footage," EPE writes on elvis.com. But as you all know, at the same time EPE won't release it, stating that, "There just simply is no way to get it only to the real fans (and we've exhausted all kinds of ideas) without also having Elvis served up to the general public and press for ridicule. They already emphasize and exaggerate the tragedy and sadness of the last years of his life too much. Right now, the emphasis for us is to remind them of all that came before." Getting it to the real fans? Hmm, I thought we had FTD for that one? Me and my brother thought about it, and discussed the possibility of making kind of an Elvis In Concert - Special Edition. This could be done by first removing all the fan comments, just like they did on the special edition of That's The Way It Is. Some of the unreleased footage (available on the bootleg DVD version) should also be used. Here I'm thinking about the footage showing Elvis arriving by car to the arena and also of him being introduced to the mayor and a Sioux Indian girl. Finally, and most importantly, some songs would have to be removed, like the terrible "Teddy Bear"/"Don't Be Cruel" medley from July 19, and other, stronger numbers, like "Trying To Get To You" and "Unchained Melody" added. And of course, some creative editing would have to be done, as some of the camera angles are less than flattering, to say the least. Of course, even with these changes being made Elvis In Concert still wouldn't be anything like "That's The Way It Is," "On Tour" or "Aloha From Hawaii." But it would present this historical television special in a more favourable light, don't you think? Good idea. I agree 100 %.